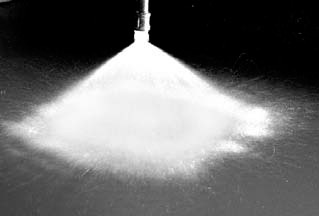 SPRAY CHARACTERISTICS: A wide angle Full cone spray pattern, with uniform distribution throughout the cone. SPRAY CHARACTERISTICS: Full cone spray pattern, with uniform distribution throughout the square cone. 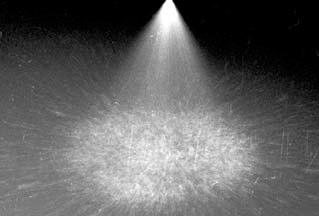 SPRAY CHARACTERISTICS: Wide Angle Full cone spray pattern, with uniform distribution throughout the Square cone. 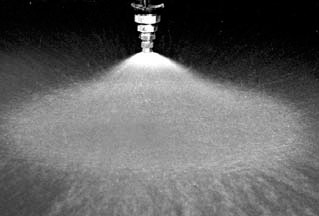 SPRAY CHARACTERISTICS: The HNS series vaneless full-cone nozzle projects a medium to coarse full-cone spray in a direction perpendicular to the nozzle inlet axis. The maximum free passage in this nozzle is substantialy larger than most full-cone nozzles due to the "vaneless" design. this nozzle is suitable for applications where a relatively coarse full-cone spray is required, and where standard nozzles are subject to plugging. 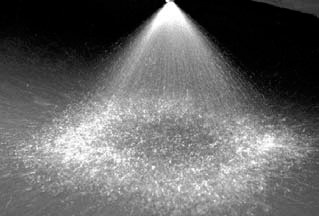 SPRAY CHARACTERISTICS: A full cone spray pattern with larger flow rates and smaller droplet sizes. Durable, one-piece, anti-clog design has no internal vane to clog or wear out.